Bel appartement spacieux au coeur de la ville avec une vue imprenable. Bel appartement spacieux de 3 chambres au 3ème étage d'un bel immeuble Cannois. Entièrement équipé et adapté pour les affaires ou les locations de vacances. Situé entre la Croisette et la rue Antibes, il est idéalement situé pour visiter Cannes et ses environs. Parfait pour un séjour en ville ou pour explorer le sud ensoleillé de la France (la principale gare routière et ferroviaire est à 2 minutes à pied). Il y a des frais de NETTOYAGE ET D'UTILITÉ supplémentaires de € 140 euros payables À L'ARRIVÉE, mon gérant se réunira et vous accueillera. Perfect location to enjoy all areas of Cannes. Lovely spacious apartment - well equipped kitchen and very comfortable reception room with English channels on TV. Very comfortable beds. Check in very easy - Mark was very welcoming and immediately dealt with a couple of small issues like light bulb replacement. Very friendly staff in Irish bar downstairs - kindly gave us free coffees on our first morning as we hadn’t been shopping yet - much appreciated- and helped with luggage. Would definitely return. Thanks for a great stay! A month was not enough! 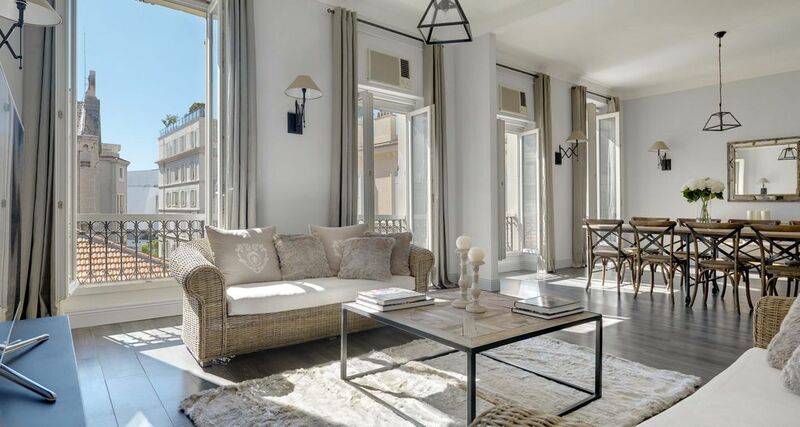 We spent the month of August at this wonderful apartment in the centre of it all in Cannes. We could not have hoped for a better place to stay. Thanks to Michael for being on top of everything all the time. Our host, Michael, was accommodating and responsive and always with a smile! We really appreciated his help and had everything we needed. We also can't say enough good things about the apartment. It was beautiful and perfectly set up for a group. The location was amazing, right in the middle of everything. Close to restaurants, the train station and the beach. And with Ma Nolan's pub downstairs that had great food and drink, we were kind of spoiled! We had a wonderful vacation and will definitely go back first chance we get. This apartment is absolutelly gorgeus! We were amazed by the care and attention to detail that were put on furnishing it and the view on the city from the large windows made it all even more dream like. Thady and Nola where very helpful and attentive during our whole stay. I would visit again just to stay in this stunning venue. I absolutely recommend it! I stayed here with my family of four and it was by far the best apartment we've ever stayed in for a holiday for different reasons. The apartment per se is stunning, very well kept, well furnished, comfortable beds and nice and equipped kitchen and bathroom, it is very clear the owner Thady and his wife Mela went through every single aspect with care to ensure the most comfortable stay. Its central position made it the more easy to find what we needed at a relatively fast time. The thing that most of all made us content and peaceful was the helpfulness and kindness of the two owners and their staff, always making sure everything was clear and providing us useful information. We also had great lunches and dinners in their family friendly Irish Pub Ma Nolan's on the same building of the apartment. Muchas gracias, we will definitely come back soon ! We totally enjoyed our holidays in this place! The apartment is amazing and exactly like on the pictures if not better !! Ideally located. Comfortable quality beds, kitchen is well equiped. Large very pleasant appartment. Helpful staff. Situé au 3ème (3 chambres) et 4 (2 chambres) étages d'un bel immeuble Cannois, 120m2 de la célèbre tapis rouge du monde (Festival de Cannes), l'éternellement chic de Croisette et de la mer d'azur est la toile de fond étincelant. L'emplacement est parfait pour une escapade en ville, ou comme un crash pad tout en explorant la Riviera. Le train se trouve à 2 minutes à pied et la ligne entre Saint-Tropez et Monaco se assure que tous les beaux sites de la Côte d'Azur sont à votre porte. L'appartement est luxueux et confortable. Le buzz de la ville est en attente pour vous de profiter, il ya des marchés de produits frais, antiquités stands aussi, musées, galeries, événements musicaux en direct, la nourriture incroyable et la vie nocturne exceptionnelle de profiter. La liste est longue. Le festival du film a lieu en mai, tout comme le Grand Prix (Monaco est à une courte distance en train). Cannes est une ville à explorer!